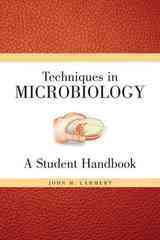 Techniques for Microbiology 1 Edition This vivid, full-color laboratory techniques handbook is an instructive, concise, graphical presentation of the skills and techniques required in an introductory microbiology lab. Clear visual instructions enable readers to carry out fundamental manipulations and procedures effectively and safely. Demonstrates those techniques that will be used frequently for studying microbes in the laboratory. Has a safety section and frequent safety cautions throughout. Has a convenient, portable 6” x 9” trim size, a spiral binding and soft cover, making it ideal for use on the lab bench surface. It is priced inexpensively so that it will be suitable as a supplement to an in-house or commercial manual. Companion to any introductory laboratory whether for biology majors or allied health majors.